We all know Razer is about to make it’s first debut into the smartphone network tomorrow. Looking at the specifications of their flagship phone, they are not gonna loose this. 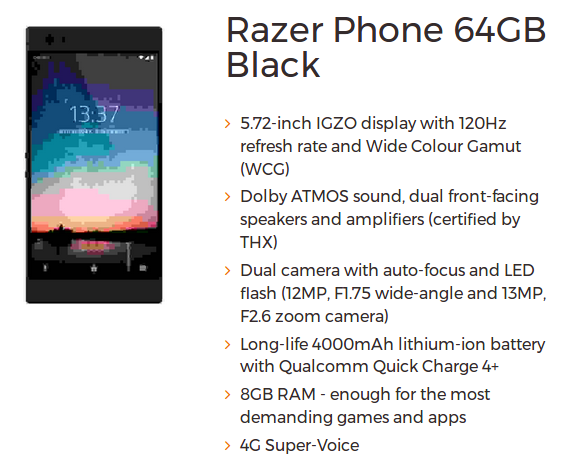 The first smartphone from RAZER will have the specifications below. 5.72-inch IGZO display 120HZ refersh rate. And Wide color gamut. Dolby ATMOS sound, dual front-facing speakers and amplifiers THX certified. A surprising specifications, right?. And you know what comes with high specs, High price. Although no word on the price so far. The brain busting feature which users will love the most is the, Dual Speaker and Dual Camera. What a nice push into the tight smartphone market competition, Nokia should watch out for RAZER.